One of the things I’ve missed most since going sugar-free is gelato, sorbetto and granita. While it’s possible to find dairy-free gelato out there these days, even here in Italy, it’s nearly impossible to find it sugar-free. I have managed to locate two spots in Milan that make a vegan gelato senza zucchero. They sweeten it with agave, so every now and again, I’ll indulge. Sorbetto and granita on the other hand are a lost cause. I’ve been wanting to make gelato and/or sorbetto at home all summer long, but without an ice cream maker, I haven’t been brave enough to try. I’ve been doing a lot of reading and researching on the subject and while there are many proposed solutions out there, I haven’t given it a go. I guess I’m still holding out for that ice cream maker and pretty soon I’ll have enough points from my supermarket loyalty card to pick up this beauty. 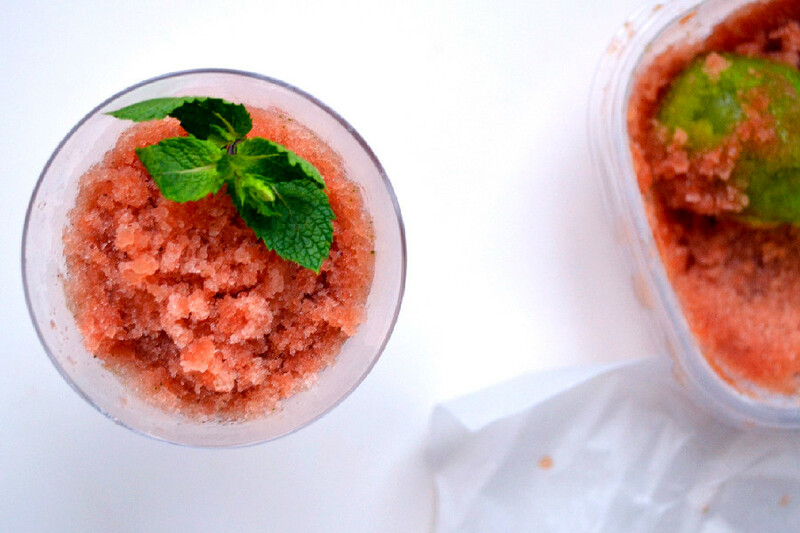 In the meantime, granita seemed like a feasible experiment to take on, especially considering the ripe watermelon we had in the fridge, it’s the perfect fruit for it. It’s sweet, juicy and thirst quenching enough to make a tasty and refreshing iced treat without the added sugar. Watermelons are summers gift for hydration and while the fruit is 92% water, it contains some powerful antioxidant and anti-inflammatory benefits. It’s extremely low in calories yet packs a punch in terms of nutrients such as lycopene, beta carotene and vitamin C.
Blend all ingredients until you have a juice. Pour into ice cube trays and freeze for about 2 hours. Blend ice cubes into a slush, pour into a freezer safe container and freeze for at least 1 hour. Remove from freezer and let sit at room temperature for about 10 minutes prior to serving. Use an ice cream scoop or spoon to scrape the frozen juice out of the container and pack it nice and tight into a serving glass. Serve with a garnish of fresh mint and a spoon. That sounds delicious! SO refreshing too. I’m not a watermelon fan, personally, but my husband sure loves it. I bet he would love this! Thanks hun! It’s super refreshing and thirst quenching. Let me know what he thinks if you try it out.